Multiple Nebula and Hugo Award-winner Greg Bear returns to the Earth of his acclaimed novel Eon a world devastated by nuclear war. The crew of the asteroid-starship Thistledown has thwarted an attack by the Jarts by severing their link to the Way, an endless corridor that spans universes. The asteroid settled into orbit around Earth and the tunnel snaked away, forming a contained universe of its own. Forty years later, on Gaia, Rhita Vaskayza recklessly pursues her legacy, seeking an Earth once again threatened by forces from within and without. For physicist Konrad Korzenowski, murdered for creating The Way, and resurrected, is compelled by a faction determined to see it opened once more. And humankind will discover just how entirely they have underestimated their ancient adversaries. 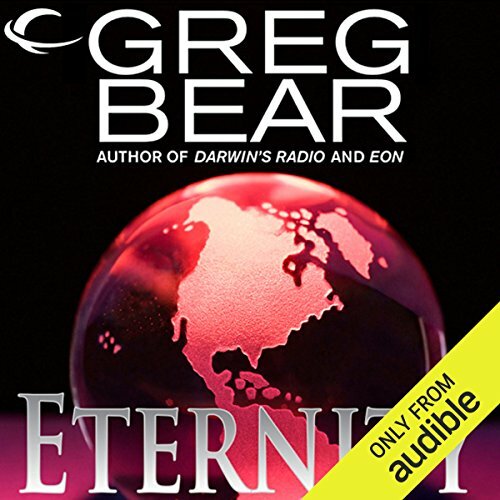 ©1988 Greg Bear (P)2012 Audible, Inc. I enjoyed this book but at the same time, as it follows Eon, could have stopped there and been fine. I don't think anyone out there would be disappointed by it if they like sci-fi but personally found it lacking that intangible thing that made Eon so much better. Excellent sequel with closure to a great story. What made the experience of listening to Eternity the most enjoyable? The culture of the "Hexamon" was fascinating. What other book might you compare Eternity to and why? He does an outstanding Russian accent and can narrate between different characters voices very well. I was satisfied by the ending. This was yet another wonderful part of this Greg Bear series. Excellent narration through wonderful universes within universes. A great story ruined by two places where the audio jumps and portions go missing. Once near the beginning, and once right at the end, cutting off the epilogue. The story is grand on any scale. Greg Bear's imagination has no limits. Stephan Rudnicki is an incredible narrator. I love listening to anything he narrates.